In 2017 the State Company ‘Yuzhny Commercial Sea Port’ handled around 12mt (million tonnes) of cargo. This is the best result in Ukraine among the state stevedoring companies. In 2018, the company plans to raise the cargo turnover by a further one million tonnes. Moreover, the aim is to boost the production capacity to 34mt within ten years. At the end of the previous year, the company approved the development project and a strategic plan to increase capacity. The plan is based on: the con- struction of a specialized cargo complex for bulk cargo; the development of the railway infrastructure; and the modernization and upgrading of handling equipment. The company conducts audits and plans to attract international investors. Today the state company uses its facilities as much as possible. The depth at the berths, which are used by the stevedoring company, makes it possible to handle Newcastlemax and Capesize vessels loaded with 200,000 tonnes and more of cargo and with draughts up to 18.5m. The development of the company and its future is a modern specialized complex for bulk cargo — ore, coking and thermal coal. Its construction is planned to be finished by 2028. This complex will provide the rise in the cargo turnover at the state terminal to 34mt per year: 24mt of export cargo and 10mt of import cargo. The project is designed to be realized in three stages: the construction of the railway cargo area, two units of defrosting facilities, stations for loading/unloading wagons; new conveyor lines; and reconstruction of berths No. 5-8. In accordance with the design and budget documentation and assessment report, the total cost of the construction will be more than $177 million. This amount is really huge for the state company, so successful and prompt modernization is possible in co-operation with the investor. Coal and ore cargoes are a high priority for the state company, and consequently, the development of the specialized complex for bulk cargo will be the object of special monitoring. Today the port starts launching projects which will provide the functioning of the company during decades. In 2017, the State Company ‘Yuzhny Commercial Sea Port’ handled about 11.6mt of cargo. Ore made up 7.2mt (61.9%), thermal and coking coal made up 1.28mt (10.4%) and 1.7mt (13.9%) correspondingly, and other cargo made up 1.42mt (metal, grain, chemical products). 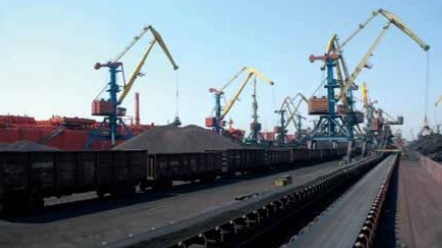 Main cargo owners are companies of SCM group (Metinvest, DTEK), state enterprise PJSC ‘Centrenergo’ and others. There were 190 vessel calls including 34 vessels with imported coal for power engineering. Cargo turnover rose by 39.4% in the fourth quarter as compared with 2016. The rise in import by 53% (2.9mt) for Ukrainian state and private companies and metal producers was recorded. In January 2018, the cargo turnover made up 982,600 tonnes, which is 17.6% more than in January 2017.